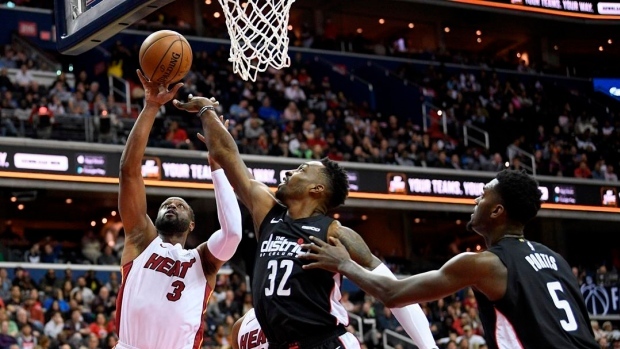 WASHINGTON — With the Miami Heat nearing the end of a grueling but successful stretch, they turned to their closer yet again. With "M-V-P!" and "Let's go Heat!" chants echoing through the arena, Wade also had nine rebounds while scoring in double digits for a ninth consecutive game. The 13-time All-Star is retiring following the season. "You're not going to deliver every night, but it (darn) sure feels good when you can deliver," the 37-year-old Wade said. "I'm glad that I can be what I once was in moments and situations when the team needs it." Dion Waiters added 19 points and Josh Richardson had 18 for Miami, which remained a game ahead of Orlando in the race for the East's last playoff spot. Bam Adebayo had 16 points and 11 rebounds, and the Heat finished a stretch of five games in seven days with four wins, including three straight. The last four games were on the road. "We knew we were going to have to fight for this," said Heat coach Erik Spoelstra. "To start off this road trip the way we did and then put ourselves in a position to be 3-1 is great, but you have to finish it." "They pretty much beat us in every way possible," said Wizards All-Star Bradley Beal, who added 16 points and shot 2 for 8 from beyond the arc. The Wizards answered on their own 7-0 run, but Tomas Satoransky missed a good look at a tying 3, off Beal's feed, with 26 seconds remaining. "I think that round ball, I think this game and I think this team is really keeping him young," Spoelstra said of Wade. "You try to enjoy and savour every single moment of this Association and this ride that we're on. It's a pleasure to be a part of it." Heat: Including Saturday's performance, Wade now has 1,013 career points against Washington. It's the 10th team he's surpassed 1,000 points against. ... G/F Rodney McGruder (knee) sat out his third straight game and F Justise Winslow (thigh) missed his fourth. Wade was the centre of attention from the moment he entered the game to a standing ovation with 4:11 left in the first quarter. "That's just love, and I appreciate it," Wade said. "I've given everything to the game that I wanted to give, and that's what I'm getting back." He kicked out to Josh Richards for a tying 3-pointer with 54 seconds left in the first half to bring out the first pro-Miami chants of the evening, and hit another 3 to close Miami's deficit to one at the break. In the third, his drive and dunk put Miami up 73-69 to another large roar, and his layup over Satoransky to make it 78-74 had the Wizards pleading for travelling. "How to attack the basket," Beal said. "That's pretty much it in a nutshell. He's one of the best two-guards at doing that, one of the best two-guards at blocking shots."